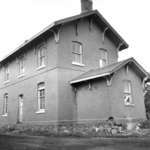 October 1965, The railway station for the Port Whitby and Port perry Railway was built in 1870 on the south side of Dundas Street opposite Hickory Street. It was used as a station until 1963 and demolished in 1969. Two insulators comprised of ceramic and metal. Used on the telephone poles beside railroad tracks. Large metal wrench used on the Canadian Pacific Railway. It appears as though item had been painted, but only a residual red colour remains. Cart used on the Canadian Pacific Railway in Schreiber, Ontario. It is comprised of wood and metal. Condition: GoodThis machine was common among Italian immigrants and their families in Schreiber. 1965 Timetables produced by the C.P.R. for information about arrivals and departures.